Erma Jones passed away peacefully at Smoky Mountain Rehabilitation Care Center in Waynesville, North Carolina on November 30, 2018 after a short illness. Erma was born on December 16, 1922 to Alice and William Buchanan in Sylva, North Carolina. She graduated from Webster High School and married Elmer Jones in 1941. They raised four children, Brenda, Ron (deceased), Sylvia, and Bruce. Erma and Elmer lived most of their lives in Virginia, but moved back to the mountains they both loved in 2001. Erma was a devout believer in Jesus, a wonderful homemaker, wife and mother. She had an insatiable passion for reading, was a gifted and accomplished seamstress, and had an exceptional green thumb. 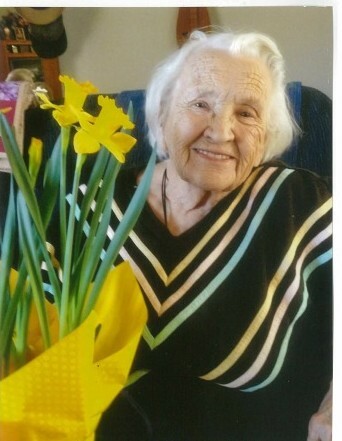 Erma could make anything grow, and absolutely loved her flowers. Erma is survived by her brothers Olin Buchanan m Jolene; Earl Buchanan m Evelyn; Jim Buchanan m Sue; three children Brenda Germano m Michael; Sylvia Stein m Marc; Bruce Jones m Caron; six grandchildren, 10 great grandchildren, and many nieces and nephews. Funeral services will be held 10 AM Tuesday, December 18, 2018 at Western Carolina Funeral and Cremation Service, 59 Cherry Street Sylva, NC. Burial will follow at Old Savannah Baptist Church. Visitation will be held on Monday, December 17 at the funeral home from 6 PM – 8 PM. The family would like to extend our gratitude to Erma’s in home caregivers, especially Audrey, who served her for six years, and the staff at Smoky Mountain Rehabilitation Care Center for their attentiveness and loving care.